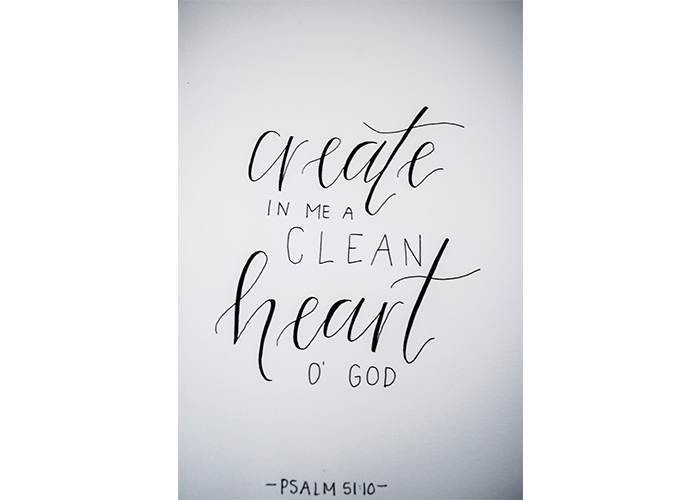 Create in me a clean heart o' God. - Psalms 51:10. Sometimes we need the reminder to have a clean heart and take action with the Lord in mind. Use this hand made, modern calligraphy print as a simple reminder of just that! This is a handcrafted piece of artwork meaning there may be some imperfections, smudges or pencil marks. This just proves that it is an original and no two pieces are alike. It is one of a kind, just like you! Interested in the frame too? Send us a message and we will give you the information on the pricing that includes the print in a hand made gold frame.